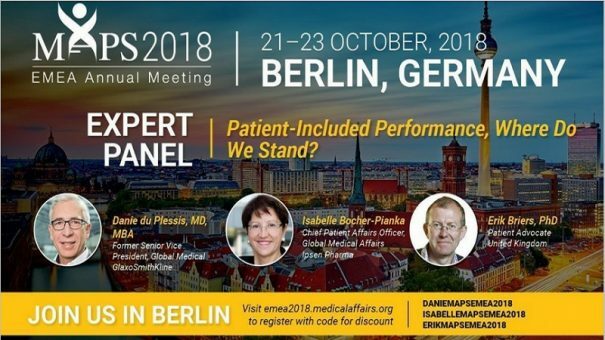 The Medical Affairs Professionals Society (MAPS) presents its inaugral European conference this year, created by medical affairs professionals, for medical affairs professionals. The event takes place at the Radisson Blu Hotel in Berlin and the full agenda can be found here. Always filled to capacity, our popular network events will provide an opportunity to mingle with MA leaders and meet new colleagues who all share your passion for raising the bar for Medical Affairs excellence. We have 2 networking events in Berlin this year, including an opening night reception on Sunday, and a riverboat cruise on Monday evening that can’t be missed! Upskill with our 10 unique, practical workshops hosted by subject matter experts. This is one area that really sets MAPS apart from most events you can attend. Interactive, high-energy, engaging—these workshops are designed to ensure that all participants get involved! Workshops will consist of small working groups (approximately 30 participants per room), providing you an opportunity to leave with a new vision of how to approach the key issues that you, as Medical Affairs professionals, face each day. Another of our most lauded activities from our meetings in the US, our rapid-fire Hot Topics sessions gather you and your peers in small groups of 10 per table with a chance to focus on key issues that challenge Medical Affairs professionals. Each 30-minute discussion will be led by a subject matter expert, and all participants will have a chance to discuss and debate critical topics, and share their pain points and solutions. MAPS is the premier global non-profit [501(c)(3)] organization offering tools and resources specifically designed to engage, empower and educate the whole MA function – across ALL MA disciplines and all levels of experience. The MAPS community presents a unique opportunity to tap into the collective experience and skills of leading MA professionals around the world. This world-class network will allow you to gain access to online learning tools, competency development programs, live events, and cross-industry standards and guidance.